Chung Yu Machinery Co., Ltd.
Straightening Wire, Straightening Machine, Frame Straightening Equipment, Wire Cutting Machine. Chung Yu Machinery Co., Ltd. was founded by Mr. Huang Yu-Kuan, the president in 1982, and now is the most professional manufactory of metal line straightening machine in our country. In order to provide our customers with high quality product, we keep on presenting new items by research and development under the leading of Mr. Huang Chien-Hung, Vice Manager of R&D Dept. and have obtained CE qualification in 1998 among all competitors, ISO 9002 certification in 2000, upgrading to be ISO9001 in 2002, and more than 10 types of new invention patent in the overseas. Our metal fully automatic wire straightening &cutting machine has won a good will for high precision quality to evidence by excellent sales result and widely export to the countries in the worldwide. Working range of our metal line straightening machine can be available from 0.5mm-18mm with all materials, and more excellent and stable model if compared to other similar types produced by the competitors. We are strict to our quality of product standard in order to make customer have good right. Besides, we also provide excellent service to our customer. We guarantee we must make you satisfy with our product and service. Therefore, if you have any question about our product, you can tell us. We will give you early reply. Furthermore, we look forward to searching a good business partner. If you are interested, please feel free to contact with us or you can email to us. Manufacturer of wire cutting machine, standard type wire straightening cutting machine, A & B type wire straightening cutting, wire straightener, frame straightening equipment, special different specification wire machine and wire straightener accessories. 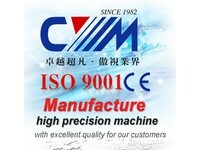 Obtained ISO 9001:2000 certifications.